Four basic elements of Honolulu Daijayama are: making a float, fireworks, chants and dancers. Toward the 25th anniversary of Honolulu Daijayama, we are renovating Daijayama with our friends and volunteers in Honolulu. This year, we will carry Daijayama with brand-new fireworks and chants! There were times when the Honolulu Daijayama could not perform at the Grand Parade due to staff shortage. 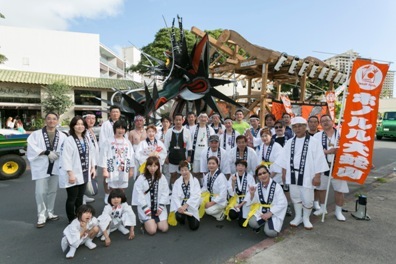 However, we were able to participate in the festival for 10 consecutive years since the 14th Annual Honolulu Festival because of the support from our friends in Honolulu. 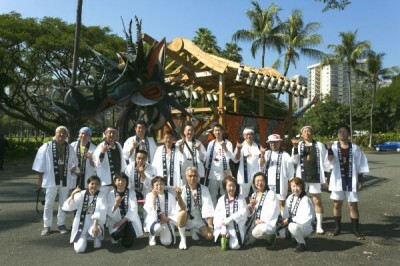 Once again the Honolulu Daijyama will be creating a ruckus this year. We have about one-third of Japanese leaders leading the parade this year. Nevertheless, we have been cultivating great relationship with volunteers in Honolulu in the past few years. This time, our Japanese leaders will be cooperating with Honolulu members in the parade. 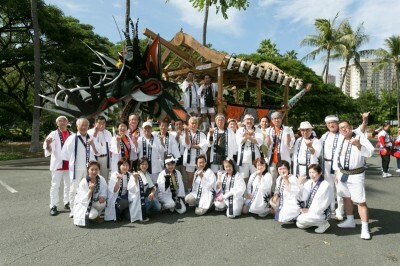 We would like to invite you to the parade and see our great cooperation between Japanese leaders and Honolulu members. This year is a very special year. We are not only celebrating the 20th Annual Honolulu Festival but also our 15th anniversary as participants in the Honolulu Festival. To honor this occasion, we are performing a special presentation at the Grand Parade. We will present Fukuoka’s Number 1 entry known as “Special Spirit of Daijayama” made of origami. 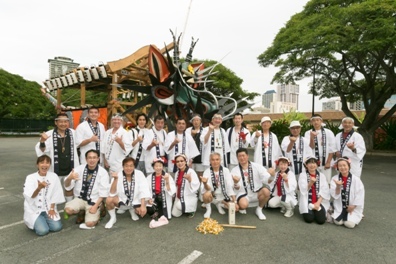 Please look forward to seeing the Honolulu Daijayama in appreciation of this anniversary at the Grand Parade. One of our founding members passed away due to an accident last year. We are here to honor him for his dedication to our cause. This is a memorial service for him. The lively sounds of the taiko and bells, the spectacular bursting of the fireworks, the enthusiasm of our dancers, the sound of the waves from the Pacific Ocean, and the soul of our deceased friend will always be connected to us by a very special bond. We will perform with the local volunteers and show the vitality and excitement of Honolulu Daijayama. The Daijayama Festival in Omuta, Kyushu is held on the fourth weekend of July every year. We hope that you will come and see the original Daijayama! Daijayama is the Fire Spitting Dragon from Fukuoka Prefecture in Kyushu. Each summer the Daijayama Summer Festival attracts over 400,000 spectators, celebrating an old legend dating back over a thousand years. Dragon floats parade through the main streets in Fukuoka Prefecture each July manned by thousands of people. Folklore has it that the dragon is a water god, blessing the farmlands with water and children with good health. The Honolulu Festival will feature this towering dragon float measuring 20 feet in height and 33 feet in length at the Grand Parade. It will be manned by over 200 people. Fireworks will light up the skies of Waikiki as the performers dance to the drums and flutes of traditional Japan. The Honolulu Daijayama, full of energy and excitement, is a performance that should not be missed.